As a leading provider of network equipment for SMBs, NETGEAR understands the importance of reliable and high performance networks. With the growth of virtualization, cloud-based services and applications like VoIP, video streaming and IP surveillance, SMB networks need to extend beyond simple reliability to higher speed and performance. The 10-Gigabit Smart Managed Switch series from NETGEAR presents the right solution for this requirement; delivering unprecedented non-blocking 10-Gigabit bandwidth at an affordable cost. The NETGEAR ProSAFE XS708T, XS716T, XS728T, and XS748T are powerful Smart Managed Switches that come with 8, 16, 24, or 44 10-Gigabit Copper ports and either 2 Shared (Combo) Copper/SFP+ ports (XS708T/XS716T) or 4 additional Dedicated SFP+ ports (XS728T/XS748T) for 10G Fiber links. The NETGEAR 10-Gigabit Smart Managed Switches are purposely designed as a cost-effective way to provide 10G connections to 10G-capable servers and NAS (Network Attached Storage) systems. They can be used at the “center of a small business network” or as an aggregation / access switch in a larger organization including workgroup access, connecting to a 10-Gigabit NETGEAR ProSAFE Fully Managed Switch on one end and extending the 10G connections to the edge. The XS708T and XS716T are also ideal for smaller workgroups that need high bandwidth for sharing, collaborating, editing, and publishing high-density content like video or animation. 10GBASE-T Copper Ethernet connections Support low-latency, line-rate 10G Copper “BASE-T” technology with backward compatibility to Fast Ethernet and Gigabit Ethernet. Cost-effectively migrate current network to 10G capacity by utilizing the existing Cat6 RJ45 short connections (up to 30m) and Cat6a/Cat7 connections up to 100m. USB Configuration Port Quickly and conveniently upgrade or restore firmware, load or backup configuration files, or download system log files for troubleshooting. Why 10G Switches and Why from NETGEAR? Ideal for SMBs to use as the core switch, connecting to 10G-capable Servers and network storage. Expand network capacity, remove performance bottlenecks and/or support premise expansion needs. Cost-effectively expand 10G bandwidth from core switch in medium-sized networks to access switches which are equipped with 10G uplinks. Powerful feature sets with advanced L2+/Layer 3 Lite functions, enhanced security measures, static routing, dynamic VLAN assignment and IPv6 management and support. Improved usability for easier and smoother deployment of voice, video, and WLAN on the same converged platform. LIFETIME warranty on hardware, LIFETIME Next-Business-Day (NBD) replacement, LIFETIME tech support online chat, and 90-days Free Advanced Tech Phone Support for peace-of-mind. 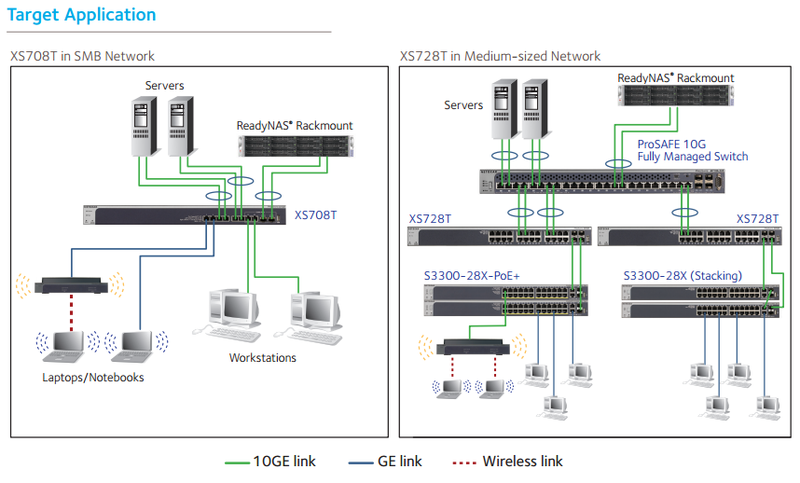 Download the NETGEAR XS728T Datasheet (PDF).